Dogs can be truly hyperactive due to a medical condition, but many are just too active for the family they live with and are not getting sufficient mental and physical exercise to feel calm. 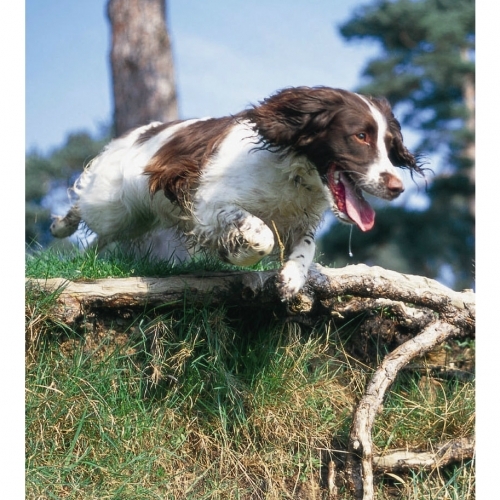 If you are concerned about your dog’s hyperactivity, take him to a veterinary surgeon to be checked out. There is a medical condition called hyperkinesis in dogs, which is similar to Attention Deficit Disorder in humans, where the dog shows very high levels of activity, has an abnormally short attention span and is very impulsive and restless. They may also to be excited or nervous, have an above-average breathing and heart rate, and may never be still until they fall into an exhausted sleep. This condition is rare but will need medical treatment. Many dogs that are unacceptably active and boisterous in the home have too much energy for their lifestyle. Most of these dogs will be descendants of working lines whose ancestors were expected to work all day every day. Confined to a home with owners who go out to work and have limited time for dog activities, these dogs have an excess of energy that all too often gets channeled into unwanted behaviour. Dogs need plenty of physical and mental exercise and stimulation if they are to feel relaxed and calm, just as humans do. Each dog will have different requirements, but, in general, young dogs will need more than very young puppies or middle-aged/older dogs, and dogs from active breeds will need more than those that were bred just to be pets. To give an example, a adolescent or young adult Weimaraner may need 2 x 1.5 hour walks per day with plenty of free-running off lead, as well plenty of active play with toys and training sessions throughout the day on a hourly basis to feel calm enough to be well-behaved and peaceful when at home. Once medical conditions have been ruled out, take a good look at your dog’s everyday life if he is hyperactive and boisterous in the house. How long does he spend running off lead and exploring each day? How long do you spend playing with him, teaching him, and taking him to new places where he can experience new sights and sounds? If the answers to these questions is ‘not enough’ or ‘not enough for a dog of this age and breed’, you will need to find ways to change his lifestyle by making time to do more with him. Get other family members involved if necessary or you may like to consider buying time from a professional dog walker or sitter.